Animal collection managers occasionally need to slow or suspend reproduction in individuals that are well represented in a population. 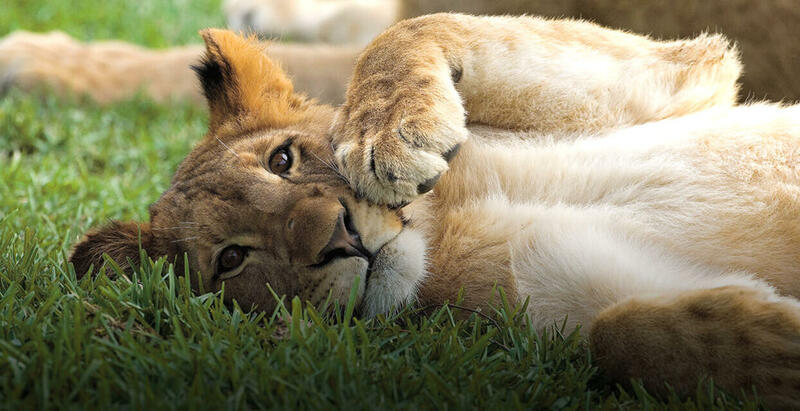 African lions at the San Diego Zoo and Safari Park have enjoyed good reproductive success in recent years. Their offspring have been shared with other zoos and are now contributing to the managed population. Several years ago, two adult females at the Safari Park Park were placed on contraception (birth control) so they could continue to live as a pride without reproducing. In a collaborative study with members of the Association of Zoos and Aquarium’s Felid Taxon Advisory Group and the Lion SSP (Species Survival Plan), our Reproductive Sciences researchers measured hormone levels in our two females in order to determine the long-term effects of contraception. When the lions failed to resume normal estrous cycling at the expected time, we treated them with hormones to stimulate estrus and ovulation. Both females responded positively to treatment by beginning to cycle, and one has subsequently produced two litters of cubs. Our Recovery Ecology team seeks to uncover how lions use chemical communication to reinforce natural behaviors and social interactions. This is part of a broader effort to study similar cues in multiple carnivore species to better understand their sensory ecology. Our long-term goal is that these data will not only enhance the welfare of lions in zoos, but also inform efforts to successfully manage and conserve them in the wild. Researchers in our community outreach program are exploring new collaborations with community, conservation, and research organizations in Kenya to support the human dimensions of lion conservation. In southern Kenya, our Community Engagement scientists are conducting research surveys that will provide critically needed social information regarding how local people perceive human-lion interactions and examine their willingness to accept lions on the private lands that are vital for connectivity between protected areas. To foster coexistence between people and lions in Kenya’s northern rangelands, our researchers and educators are collaborating in the development of a conservation education program aimed at increasing local understanding of lion ecology and how to reduce potential conflicts with lions.